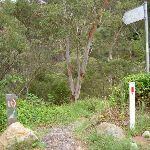 From the car park, this walk heads to the service trail gate parallel with the road (approximately in line with the end of the grassy median strip) and then onto the trail behind. The track passes through the heath for a while until it nears the cliff edge and narrows. 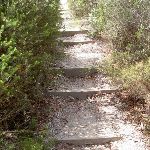 The walk continues around the hill through the heath for some time to then begin a descent over a rocky surface with cut-in stairs. The track winds right, keeping with the cliffline while looking out to the valley on the left. 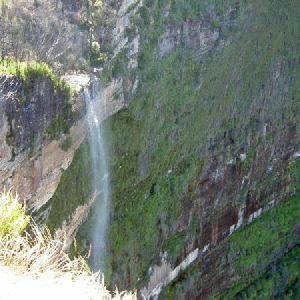 Be mindful of climbers and falling objects along these cliffs. The cliffline disappears behind scrub as the track reaches a man-made basin filled by drips from the cliff roof above. The track rounds out of this glen to climb up the hill, through heath to the signposted intersection. Veer left: From the intersection, this walk keeps the valley on the left as the track soon meets the cliffs, coming to the intersection, where there is a rock with direction arrows painted on it. 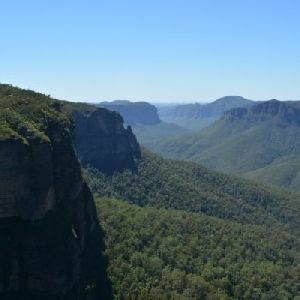 Veer left: From the painted rock, this walk follows the ‘Porters Pass’ arrow, heading down the hill with views of Kanimbla Valley to the left. The hill tends right for approximately 50m before coming to an unsignposted intersection above stairs. 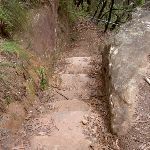 Turn left: From the intersection, this walk heads down the stairs (cut into the rock), soon passing under a railing bar. The walk comes to a landing in the staircase, just above a creek coming out of the canyon. Turn sharp right: From the stairs, this walk heads away from the landing along a less-defined path, into the canyon. 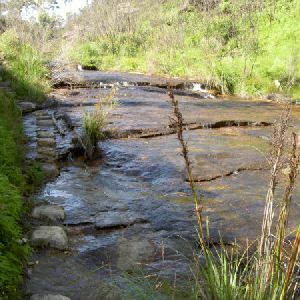 The track leads to a rock ledge which follows the creek (below on the left) for approximately 50m to the pool before a waterfall. 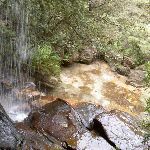 (Alternatively, a wetter track follows the cliff for approximately 30m to drop to the left, into the creek, and continue to the waterfall). At the end of this side trip, retrace your steps back to the main walk then Turn right. 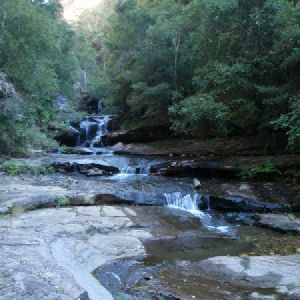 Continue straight: From the landing, this walk follows the canyon creek (on the right) downstream, taking the railed stairs down the canyon wall. The walk then crosses through large rocks to the cliff on the other side of the pass. The track then winds along the bottom of the cliffline, which it keeps on the right. 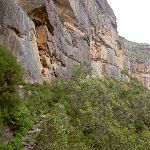 After approximately 1km, the walk heads into a pass in the cliffs then leaves the cliffline, crossing a few rocks with railings over them to climb up the side of Porters Pass. 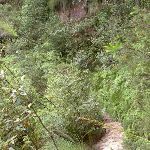 The track passes between two large trees and comes to a creek (before some stairs). 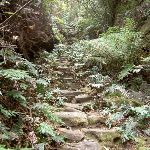 Continue straight: From the creek, this walk leads up the steep rock steps, away from the rock overhang in the cliffs. 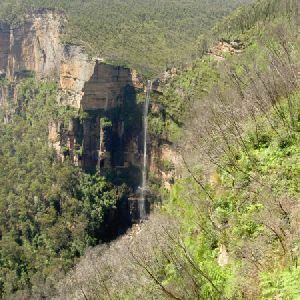 The walk heads out of the gorge following a few flights of stairs, leading to an area above the gorge with views of the Kanimbla Valley (to the right). 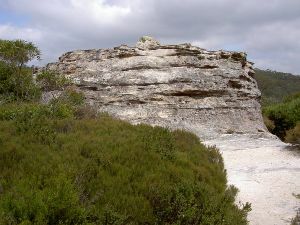 The track meanders up the hill for approximately 100m, coming to a few tracks which all lead up the hill to the same rocky outcrop. 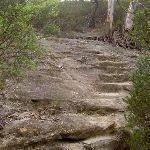 The walk follows any of these tracks up the hill, until above the large rocky outcrop. Continue straight: From the rocky outcrop, this walk leads up the stairs, with the valley behind. After approximately 50m, the walk comes to an unsigned intersection. Continue straight: From the intersection, this walk heads down the hill along the track, with views of the valley to the right. The walk heads down the steps then levels out briefly before continuing up the hill to the end of Burton Ave.
Continue straight: From the end of Burton Ave, this walk heads up the hill, following the power lines to Kanimbla Rd. 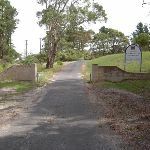 At Kanimbla Rd, the walk turns right and continues to the gates of Blue Mountains Christian School (cnr Thirroul Ave). Continue straight: From the front entrance of Blue Mountains Christian School, this walk passes through the school gate, keeping the playing field to the right. The walk heads toward toward the power pole, down the bush track on the left. The track heads down a slight hill shaded by some large pine trees, then rises up to pass by a playground. 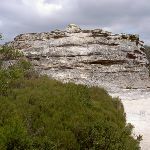 The walk then does down into an area of heath, and after approximately 300m, comes to the clearing below Fort Rock. 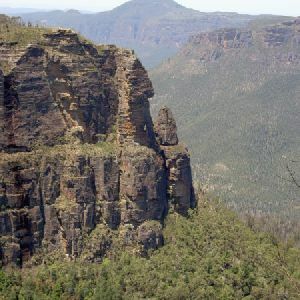 Fort Rock, Blue Mountains National Park, is a formation of rock that sits alone in solitude above Centennial Glen valley. It looks very similar to a rook chess piece. 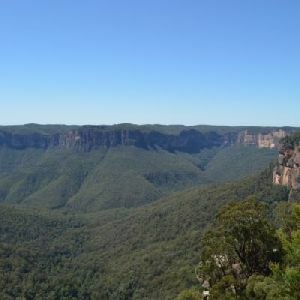 From the top of the rock, there are stunning views over the Megalong Valley and Kanimbla Valley. 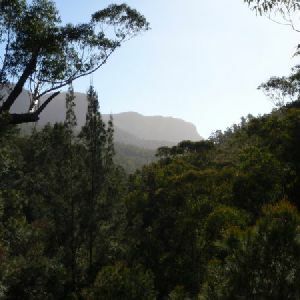 Turn right: From the clearing below Fort Rock, this walk heads towards the views of the valley. The track continues through the heath for approximately 100m along the most worn of the tracks to the rocky outcrop on the edge of the cliff. At the end of this side trip, retrace your steps back to the main walk then Veer right. Veer left: From Fort Rock, this walk heads down the hill towards the rocky outcrops in the valley below and the houses above. 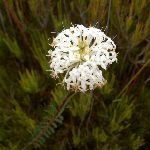 The track descends steps through the thick heath vegetation for approximately 50m. 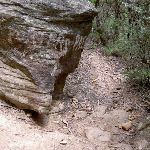 The walk then comes to a rocky outcrop, and crosses this to where ‘Porters Pass’ and ‘Fort Rock’ have been hand-painted on the rock. 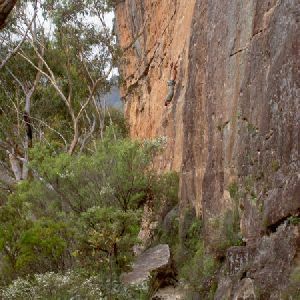 Veer right: From the rocky surface, this walk follows the arrow to ‘Porters Pass’ down the hill. The track heads down through thick heath to come to a set of stairs in a narrow pass. 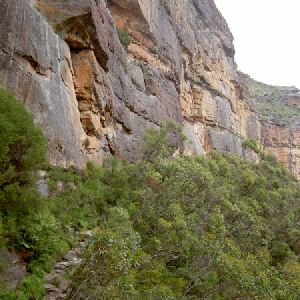 The walk leads down the stairs to a clearer area, lined with cliffs. The track keeps with the cliffs on the left to wind into Centennial Glen with a waterfall over the track. 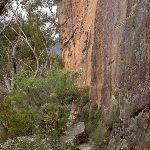 The track continues to follow the cliffs on the left to a boulder marked in white paint ‘Porters Pass’. 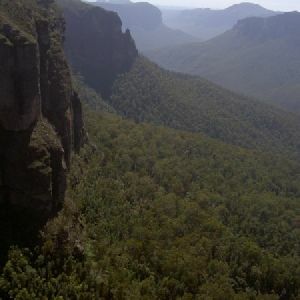 Veer left: From the intersection, this walk follows the clearing below the cliffs (left of the track) for approximately 50m. 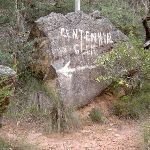 The track comes to an intersection marked by two rocks, with ‘Centennial Glen’ and ‘Porters Pass’ painted on them. Veer left: From the intersection, this walk keeps the valley on the right as the track soon leaves the cliffs to meander around the hillside, coming to the steps on the left. Turn left: From the intersection, this walk heads up the stairs that round the rocky outcrop (on the left). 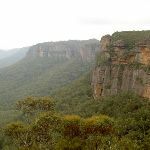 The walk winds up to look out over the Kanimbla Valley before continuing up through the heath for a short time to the car park. 4.9km of this walk has short steep hills and another 440m is flat with no steps. 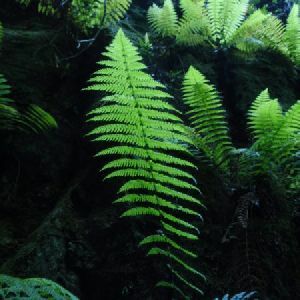 The remaining (65m) has gentle hills with occasional steps. 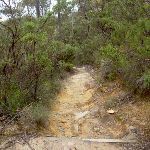 3.2km of this walk follows a formed track, with some branches and other obstacles and another 1.8km follows a rough track, where fallen trees and other obstacles are likely. 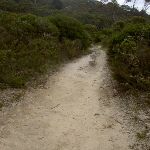 The remaining (440m) follows a smooth and hardened path. 3.5km of this walk has directional signs at most intersection and another 1.3km has minimal directional signs. The remaining (530m) is clearly signposted. 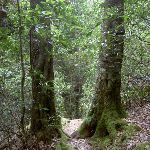 Around 4km of this walk requires no previous bushwalking experience, whilst the remaining 1.3km requires some bushwalking experience. 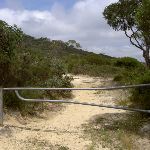 3.5km of this walk has limited facilities (such as not all cliffs fenced) and another 1.3km has limited facilities (such as cliffs not fenced, significant creeks not bridged). 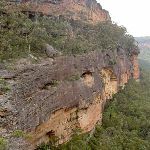 The remaining (530m) is close to useful facilities (such as fenced cliffs and seats). 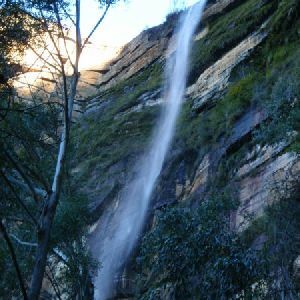 A list of walks that share part of the track with the Walls Ledge, Porters Pass, Centennial Glen Circuit walk. 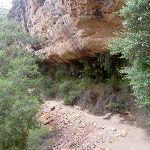 A list of walks that start near the Walls Ledge, Porters Pass, Centennial Glen Circuit walk. 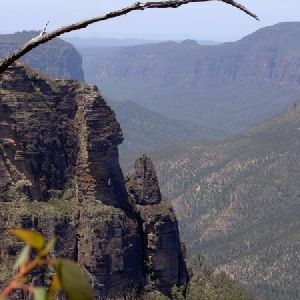 http://new.wildwalks.com/wildwalks_custom/includes/walk_fire_danger.php?walkid=nsw-bmnp-wlppcgc Each park may have its own fire ban, this rating is only valid for today and is based on information from the RFS Please check the RFS Website for more information.